If you had to pick a single invention in a game you were most proud of what would it be? I can’t follow directions, so here are a few. There was this dungeon that was built under the vacation villa of some powerful noble family. It was designed so that the floor of the villa was also the ceiling of the dungeon, in some places glass, in other metal grates. So the owner could host soirees where the entertainment was adventurers fighting their way through the monsters and traps of the labyrinth below, like a gladiatorial combat. Adventurers would also occasionally get a glass of champagne dumped on them if they were boring the guests. My D&D firearms rules. In terms of game mechanics, guns work exactly like crossbows, but: guns make noise and are easier to conceal, crossbows are quiet but are hard to conceal. Giving XP for session reports. I give bonuses for: writing from character perspective, mentioning awesome things other PCs did, and going the extra mile (one player collected on this for writing in iambic pentameter). When was the last time you GMed? I don’t remember exactly, which means it has been too long. Give us a one-sentence pitch for an adventure you haven’t run but would like to. Here I go not following instructions again. Vecna Lives! with the pregens and second edition rules. Deadwood on the Dying Earth as imagined by Cormac McCarthy where the wilderness is also the land of faerie. What do you do while you wait for players to do things? Examine my notes, make sure I have relevant data for nearby things so that players don’t get the tabletop equivalent of a “content loading” message. Sometimes I just watch the players go back and forth with crazier and crazier explanations of whatever it is they are trying to understand. What, if anything, do you eat while you play? Recently, this has been oolong tea and dried mangoes. But often, nothing. Do you find GMing physically exhausting? I find myself more tired on the days when I work a full day and then run a game afterwards than on the days when I only work, so I suppose so (to some degree). What was the last interesting (to you, anyway) thing you remember a PC you were running doing? Luring the floating head from Pod-Caverns of the Sinister Shroom into a sack, tying a rope to it, and making it into a balloon. Do your players take your serious setting and make it unserious? Vice versa? Neither? In my experience, a game of D&D is exactly as serious as the least serious person at the table. I am rarely the least serious, and usually the referee, so my setting is usually made unserious. I’ve learned to sit back and enjoy this as part of the show. What was the last non-RPG thing you saw that you converted into game material (background, setting, trap, etc.)? This bottle of vodka I just bought. The next healing potion my players find will look like this. What do you do with goblins? What’s the funniest table moment you can remember right now? The halfling getting knocked down to zero, making some crazy long odds saving throw thing, and then getting knocked right down again. You had to be there, but trust me it was funny. What was the last game book you looked at–aside from things you referenced in a game–why were you looking at it? The 3 LBBs (because of this discussion about thrown crossbow bolts). Who’s your idea of the perfect RPG illustrator? My head is in OSR-space right now, so that is certainly affecting this list. I can’t pick only one, and I’m sure this list leaving out many worthy artists, especially those less associated with RPGs already. Does your game ever make your players genuinely afraid? Prior to recently, I have only rarely run modules. As one of those exceptions I ran the Ravenloft Touch of Death module for a player who had tomb raider type of character. It ended up feeling very Indiana Jones. What would be the ideal physical set up to run a game in? A swanky board room. Leather, chrome, and marble. Rothko paintings. Maybe a stray piece of ancient Greek sculpture. Like the Philip Johnson Glass House, but at the top of a fancy office building. Attendants in sharp suits serving great cocktails. If you had to think of the two most disparate games or game products that you like what would they be? The Stratego board game. 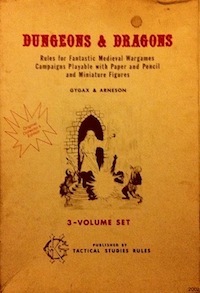 D&D books. If you had to think of the most disparate influences overall on your game, what would they be? As a GM, what kind of player do you want at your table? Those who aren’t only concerned with optimization and are willing to engage with the setting in play (by engagement, I don’t mean willingness to read infodumps, I mean willingness to explore and create some of their own goals). What’s a real life experience you’ve translated into game terms? Is there an RPG product that you wish existed but doesn’t? I have such a wealth of unexplored material already that it seems ungrateful to ask for more. I like reading other megadungeons, especially if they have unique premises. More wilderness generation tools. Is there anyone you know who you talk about RPGs with who doesn’t play? How do those conversations go? Yes; I tend to get overly enthusiastic, and they tend to nod and smile. This entry was posted in Uncategorized on January 21, 2012 by Necropraxis. these are really delightful, honest answers. I totally relate to the seriousness and talking to non-gamers points.